“How To” is a series on tips and tricks for attending conventions all over the country. If you have a tip for us or a convention you’d like to see covered, please comment below! From its inception in 2010, the Chicago Comic & Entertainment Expo (C2E2) quickly became one of the top tier geeky events in the country. Held in April (usually), it’s well worth risking the dodgy Chicago spring weather for the panel discussions, celebrity photo ops, massive vendor floor, and of course, epic cosplay viewing. 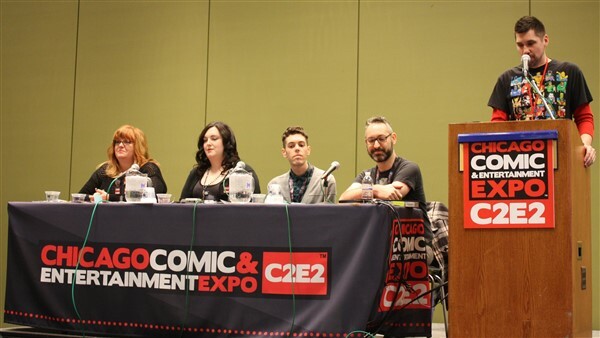 The next C2E2 will take place April 6-8, 2018 in the South Building at McCormick Place (2301 S. Lake Shore Drive). For convention information and to purchase tickets, visit http://www.c2e2.com/. Chicago is a hub for any number of airlines, trains, and interstates, so you have plenty of options for getting into the city. I’ll leave the googling of various options to you, with just a few caveats: Midway is the closest airport to McCormick place, but if you can find a much cheaper flight into O’Hare, it’s probably worth the hassle. Amtrak and some of the suburban commuter Metra trains come into Union Station, but many Metra trains come into Ogilvie Transportation Center (OTC), so be sure you know where you’ll be arriving. Chicago traffic is notoriously unpleasant during rush hour – if you’re driving and can arrive during the day Thursday, it will make life easier, as Thursday and Friday evenings have the worst traffic of the week and it starts to pick up by about 3pm downtown. Chicago has one of the best public transit systems in the country, so this will likely be the cheapest and easiest means of arriving at C2E2. First things first, there are three transit systems that operate in Chicago: Metra, the large, suburban commuter trains; Pace, the suburban bus system; and the Chicago Transit Authority (CTA), the city buses and El trains (short for ‘elevated,’ in case you were wondering). These systems all connect and cover different but overlapping areas. Pace and CTA use the same payment system (called Ventra), but Metra has its own ticketing system. Metra also has dramatically different frequencies from CTA and Pace (CTA/Pace typically runs every 5-20 minutes; Metra trains are generally every hour unless it’s a rush hour route). Know which one you’ll be taking before you arrive. Check out the CTA, Pace, and Metra websites in advance of your trip to look at route maps, schedules, and ticket prices. The main entrance of the McCormick Place South Building, where the convention is held, is on South Martin Luther King Drive, between Cermak Road and 24th Place. The convention center has its own Metra station, and is within walking distance of the Cermak-McCormick CTA Green Line station and 29 bus. The 3 and 21 buses stop right across the street! If you’re staying downtown, the Metra Electric line might be the best way for you to get to McCormick Place, but most likely you’ll only be using the CTA. Ventra is the CTA’s ticketing system and if you’re only in Chicago for C2E2, you can just buy a weekend pass. But if you’re here every year or for more than just this event, the most cost effective option is to buy a Ventra card and register it online. This way you can connect it to a credit card and automatically refill the balance when it gets low. El stations will have machines at which you can easily put more money on your Ventra card, but this won’t be an option if your balance is low and you need to get on a bus. McCormick has free shuttles between the convention center and Union Station, OTC, and many downtown hotels, so take advantage of this option! Driving in Chicago gets expensive (and frustrating) fast. Downtown traffic, especially when there’s a big event happening, can be at a total standstill. Most Chicago hotels charge an additional fee per night for parking, ranging about $30-60. McCormick Place has its own very extensive parking lots but with the growing popularity of C2E2, they fill up fast (generally all lots are full before midday Saturday). Check with McCormick for current parking rates. Many of the lots are a good distance from the South Building, so McCormick provides shuttles, and accessible parking is available in Lot A, Lot C, and at the Hyatt Regency. If you don’t mind the walk, there is some parking outside the McCormick lots; check SpotHero and Parking Whiz for spots you can reserve. Should you park on the street, look very carefully for nearby signs with any parking restrictions, as the Chicago parking authority becomes overzealous during special events. One of the big advantages of parking at McCormick is that you can drop off purchases in your car, bring a change of clothes, take a break from it all, etc., so if you’re getting in early, it can be worth it. Your third option for transportation around the city is rideshare: Lyft and Uber both operate in Chicago. These can be convenient options in the mornings, but be aware that traffic and event-weekend surge pricing will make this a less convenient option most of the weekend. The closest hotels to McCormick Place are the Hyatt Regency, which connects directly to the South Building, and the Marriott Marquis, which connects to another McCormick building only a block away. Other hotel options in the neighborhood are almost non-existent so if you need to be near the convention center, try to get into one of these two. Hotel rates directly through C2E2 are generally cheaper than regular rates at that time, although they still run around $250-$350/night. Parking costs extra at most Chicago hotels so if you can park elsewhere or avoid driving, that’s a good idea. The C2E2 hotel block opens up in early November and fills up fast. There are far more options downtown, which are usually cheaper, too. C2E2 provides shuttles between many downtown hotels and the convention center, and there are buses and trains that will take you right to McCormick. In addition to Google and the usual travel websites, OnPeak.com is geared towards finding the best event-specific accommodations. Almost all hotels allow you to cancel your reservations with no penalties within a certain time period (usual two days), so it’s safer to book a room even before you’re sure that you’re going. Other people will be happy to take that room if you need to cancel! There are usually a number of AirBNB places available, so if you’re a member, it’s a good option. If you are staying longer than the weekend, travelling with children, or have a large group, AirBNB accommodations are cheaper and more comfortable than hotels. A miscellaneous note on travel: credit card, airline, and hotel loyalty programs are great ways to save money on travel. Both the Hyatt and Marriott chains have their own loyalty rewards programs. Check out the specific terms of service, but many programs give you points, free nights, etc. for travel you were doing anyway. General admission badges for attending C2E2 have never sold out (so far), but VIP badges and photo ops do! If those last two are a high priority, be sure to buy them quickly (get on the C2E2 mailing list for early notification). Do buy your badge in advance, though, because they are more expensive at the door. If you can, go to Will Call Friday or early Saturday because the line will be … time-consuming later. If you’re an educator, retailer, artist, or in another profession related to comics or pop culture, look into professional badges, which will give you a nice discount (just be sure to do it well in advance as professional registration closes a month or so before the convention). If money is tight and you’re local to Chicago, there are usually many opportunities to try to win badges (plus they’re fun events!). C2E2 Facebook groups are the best way I’ve found to find these kinds of events. McCormick allows outside food, so bringing snacks or a lunch is a good idea. There are quite a few options for purchasing food onsite, but they’re predictably expensive. On the building’s second level, there’s a Connie’s pizza and a pretty decent food court that serves salads, sandwiches, and a variety of soups and entrees, in addition to having a nice view for people watching! There’s also a Starbucks and a small dining area (sandwiches, chips, cookies, etc.) on the north side of level 2.5. Eat early: the lines can be LONG and items often sell out by the afternoon. McCormick is a big place, so it has a lot of bathrooms. Don’t bother waiting in line; just walk a little further to find another one. There are bathrooms on every level of McCormick, and family/one-room restrooms on the second level. I believe there are also changing tables in all the bathrooms, but I haven’t verified this for the men’s rooms (sorry). The costume viewing at C2E2 is top tier, but if you want to kick it up a notch, check out Crown Champions of Cosplay, one of the convention’s premier events. In 2017, C2E2 instituted a new attendance procedure for the show: badge-holders line up Saturday morning to get wristbands that get you into the show that evening. Be warned that this is a very popular event and you’ll need to be in line when (or before) it opens at 9am. 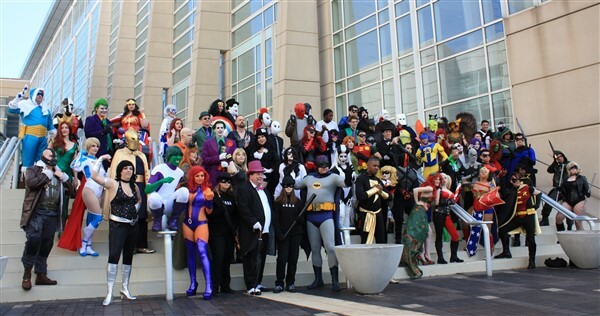 There’s plenty of cosplay viewing on hand in the halls of C2E2, but you can also track down costume themes doing group photo shoots. There are almost always groups for Marvel, DC, Disney, Game of Thrones, and a variety of various video games, films, and TV shows. The C2E2 Photoshoots Facebook group publishes a schedule of shoots each year, if you’d like to participate. If you need help with a costume or have a technical malfunction, visit the We Are Cosplay and Arda Wigs tables. Their helpful volunteers are happy to assist with getting costumes on (they usually have changing rooms) or small repairs (you can help them out by donating repair supplies like super glue, safety pins, etc.). Check the event maps to find them, as their location moves. If your costume incorporates weapons, be sure to review the prop weapon policy. C2E2 doesn’t allow realistic prop weapons or props made of hard materials. C2E2 DC comic book character costume photo shoot. Get cash in advance. Almost all vendors take credit cards now, but cash transactions are easier for everyone. ATM fees at the convention are predictably high and lines can be long, so it’s best to come prepared. Friday is the slowest day, Saturday the busiest. Sunday is family day, so it’s less busy than Saturday, with lots of kids and Disney characters around. If you’re going more than one day, visit the vendor floor on Friday or Sunday – it gets so full on Saturday you’ll barely be able to move! 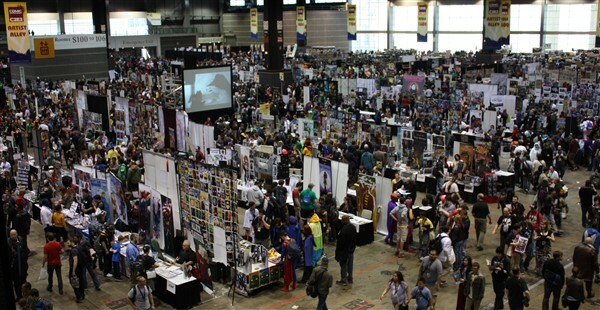 The vendor hall has numbered aisles – make note, they’re really helpful in finding vendors, your friends, etc. Pockets and backpacks are a good idea if you plan on making purchases. It behooves you to plan out what you want to spend beforehand – it’s easy to lose self-control on the vendor floor! Be aware that security checks bags at the entrance to the vendor floor, so not having a bag can expedite your entrance on Saturday. The weather is unpredictable in April, and the convention hall can get chilly, so you may or may not need a coat on any given day. McCormick Place provides coat and bag check for a small fee (it’s at the main entrance, bottom of the stairs, between the fountains and the entrance to the Hyatt). Coat check may close before some panels and screenings do, so you will need to pick up your things before then! C2E2 has a handy app that lists each panel, screening, etc. under the appropriate category and lets you add them to your schedule. It even pings you with a notification when it’s show time! Arrive at panels 30-60min. before they start. Many fill up fast and they won’t allow rooms to fill over capacity. There will be C2E2 volunteers outside each room to monitor the line and handle crowd control for the room. You can usually stay in the room for consecutive panels, but this likely won’t be allowed at the more popular ones. Please don’t hold places in line for people who aren’t there; the people who’ve been waiting deserve to get a seat (large panel lines won’t let you do this anyway). As conventions get bigger, they tend to get more complicated, but don’t be discouraged! Going to C2E2 is well worth it for the sheer scale and variety of entertainment the convention has to offer!